Getting the best results from the ever-reliable Skunk family is now easier than ever with White Label’s feminized Skunk Automatic strain - a new auto-flowering hybrid bred from one of the world’s favorite marijuana varieties. Breeders regard the original Skunk #1 as the benchmark of fast, uniform, high-yielding performance and her rock-solid genetic makeup has influenced hundreds of modern hybrids. The potency of this branch of the cannabis family tree is so notorious that 'skunk' is often used as a general term for all types of powerful ganja. Creating an auto-flowering seed version of this classic strain was an obvious choice! Skunk #1’s reliable, consistent, powerful genome has been cross-bred with a carefully selected auto-flowering Cannabis ruderalis cultivar to create Skunk Automatic - a robust, pleasingly productive strain that’s very easy to grow. Flowering begins automatically, as early as the sixth week of vegetative growth, around the time the plants produce their fifth to seventh set of true leaves. 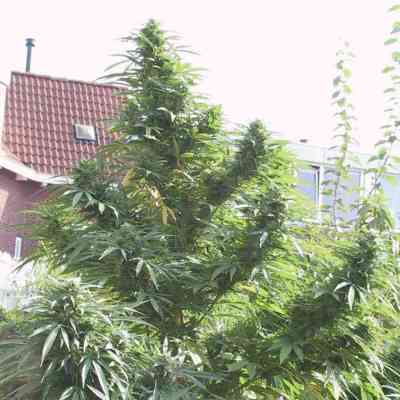 Skunk Automatic seeds germinated in the spring and planted outdoors can be ready for harvest as early as August, even in cooler climates. Indoors, a generous crop of dense, crystal-coated buds can be fully mature a mere seven weeks after the first signs of flowering appear. Skunk Automatic seeds produce compact cannabis plants which gain somewhat less height in flowering than the original Skunk #1. These auto-flowering ladies still follow the powerful Skunk growth pattern of short internodal gaps between strong branches laden with thick, succulent colas. Skunk Automatic’s potent effect displays her Sativa heritage, combining a clear cerebral high with a powerfully relaxing stone. Her scent is unmistakably Skunky - sweet, pungent and mouth-watering!